Global debt is piling up at an alarming rate. 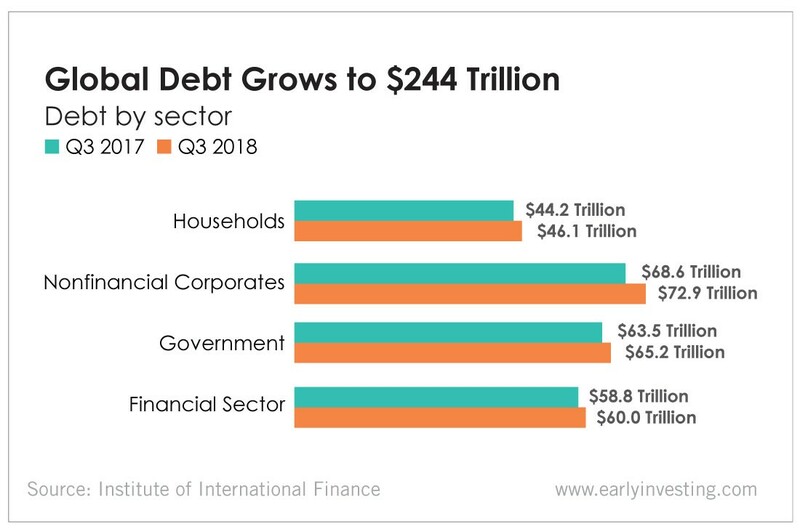 According to the Institute of International Finance, global debt has grown to $244 trillion as of the third quarter of 2018. That’s more than three times the size of the entire global economy. Household debt is now at $46 trillion. Nonfinancial corporate debt is at $73 trillion. Government debt is at $65 trillion. And the financial sector has racked up $60 trillion in debt. The global debt-to-GDP ratio has gotten to dangerous levels as well, exceeding 318% in the third quarter of 2018. That’s only slightly below the record 320% ratio we saw in the third quarter of 2016. The IMF recently presented extensive data on debt as well. It found the top three borrowers in the world – the United States, China and Japan – account for more than half of global debt, exceeding their share of global output. And in the private sector, debt has tripled since 1950. One of the newer trends is the rise of private debt in emerging markets (led by China) overtaking advanced economies. Early Investing Co-Founder Adam Sharp has written extensively about the world’s debt problem… and how we will be in serious trouble if it’s not dealt with. Debt has piled up rapidly since the last crisis at the corporate, government and personal levels. The global financial situation has gotten only worse in the 10 years since bitcoin was born. The Wall Street Journal just reported that total global debt has tripled in the past two decades and is approaching $250 trillion. Fiat money is starting to falter. Governments and central banks are proving once again that they cannot be trusted with the power to create unlimited money. The report paints a bleak picture. And it highlights the need for an alternative system – a system without unsustainable debt and irresponsible fiscal policy.